Silver Music was founded by Ellen Rose Silver in 2005 after 14 rewarding years of teaching Suzuki cello. Ellen created the Ready Set Play class for children in her son’s preschool who were interested in exploring instruments, as a response to many parents asking which instrument their child should play and when and how to start them. She took the Pre-Twinkle stage of the Suzuki approach and added the physical and improvisational elements of Dalcroze methodology to help children develop the preliminary skills and interest in cello, violin, and piano before they chose one instrument for private study. Students then went on to study violin, cello, and piano when they were truly ready to learn from a teacher in a focused way. We’ve now incorporated viola and flute into our introductory and instrumental program. Our goal is to carry the enthusiasm generated in our beginning classes forward into the discipline and structure of the private lesson when children and parents are ready. 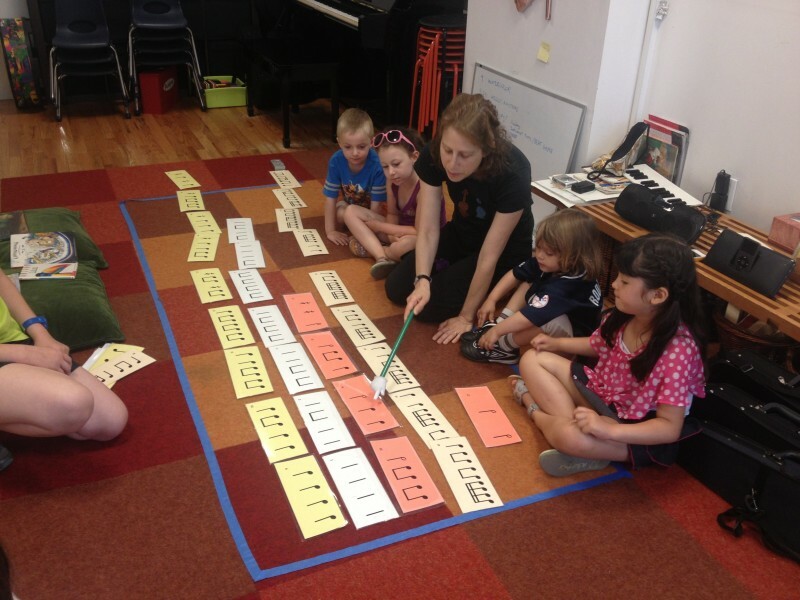 Over 1000 children have enrolled in our classes, and our Instrumental Program is 160 students and growing. We have a close-knit and incredibly committed and professional group of teachers, an equally warm and wonderful group of parents, and absolutely wonderful students who we delight in teaching each week! Music making for children at Silver Music incorporates elements of the Suzuki Method and the Dalcroze Method of music education. The repetition, listening, imitation, structure, and small steps of the Suzuki Method are combined with the improvisation, musical discovery, and movement and rhythmic emphasis of the Dalcroze Method to offer children a broad range of experiences. Dr. Shinichi Suzuki realized that all children learn to speak their mother tongue through being exposed to language from an early age, learning in small, sequential steps, and being praised and supported in their efforts. He brilliantly applied these principles to the study of instrumental music and developed a fun and child-centered way to introduce string instruments to very young children. Emile Jaques-Dalcroze saw the difficulty young students had in the traditional study of rhythm and theory, and also noticed how easily and eagerly these same children could walk, run, skip, and jump. When they experience the rhythmic pulse with their bodies in space through the natural movements of walking, running, and skipping, children may achieve a rhythmic understanding of music that is brought to the instrument. Through improvisation and creative music-making, children gain confidence in their musical voice. All the teachers who have worked with our daughter have a deep understanding of music, but also of children. Ellen, Karolyn, Sage and Reenat bring joy and love to their students along with great seriousness about the work. We are in awe of how, because of this, our daughter has given herself over to the violin, the music, and to her friends at Silver Music. At home, we rarely put her violin in its case anymore, and she hardly ever passes it by without picking it up and playing it. Listening to and playing music has become an essential part of her life and ours. It’s with great anticipation that her 4-year-old sister now picks up the cello and begins her musical journey. We are indebted to Silver Music for what it’s giving to our girls and us. Ellen Silver is probably the most gifted teacher I have ever encountered, at any level of musical training. Her rapport with the students, her intuitive grasp of their needs and capacities, her enormous range of techniques and her straight prowess, both as a teacher and as a professional musician, place her and her program far ahead of the field. The children learn amazing amounts of actual musical skill and have a terrific time doing it. In my opinion, what they learn about learning, and the many strategies one can apply, in the hands of such a patient, caring, creative and attentive person is the most valuable lesson of all. I am a professional musician who has studied with experts all my life and all over the world. I completed my Doctorate at the Juilliard School and do a lot of teaching myself. My own son has been in Ellen’s class and loved every minute of it. Observing her at work is an enlightening experience for any parent. My six year-old daughter absolutely loves her class, and looks forward to it.It gives her the exciting opportunity to discover and explore various instruments in her musical education journey, which she did not have in other music schools. As a result, she has enthusiastically decided (on her own!) that she would love to play the cello. My 4-year-old daughter absolutely loves music classes at Silver Music– always a high point in her week. She has learned a great deal more than I ever would have thought possible at this age. She has begun to acquire the basics of rhythm and melody, and has become acquainted with a wide variety of instruments – all in the company of three other, delightful kids her age. I enjoy seeing the teachers at work, and I marvel at the method; so much rigor, yet such fun! The teachers have tremendous patience with the children. It has been wonderful to see their interest in and knowledge of music blossom and mature, while their proficiency with different instruments grows. My son has taken the class for two years running – and he can’t get enough of it. The classes are well-structured, but flexible enough to maintain the engagement of young children. Child-sized instruments are perfect for little fingers. A great experience all around! Ellen is a great music teacher because she completely tunes in to her students, integrating their strengths and interests into every aspect of what they learn. She knew that my son loved telling stories and that for him sounds and instruments could become characters; it wasn’t long before they were playing duets of ‘Peter and the Wolf’ on the violin and cello. My daughter has been taking group lessons for about a year and loves it. The classes are small and personalized; they build confidence, as well as competency. They are also experiential and varied – one week she might play cello, experiment with drums and compose music using actual notes and sound patterns, and the next she could play violin, work with bells and practice note clusters on the piano. She has so much fun, she has no idea how much she’s learning. Ready-Set-Play! has been my daughter’s primary introduction to music – and such a positive one! The experiences are rich and varied, and the learning environment so warm and encouraging. I wish I had had a class like this when I was a child.